So thinking my bread baking skills meant I was a fantastic baker all round, I decided to make some cupcakes for Jill’s birthday bash. (She was sharing it with guys called Gavin and Michael, so that explains the g and the m). 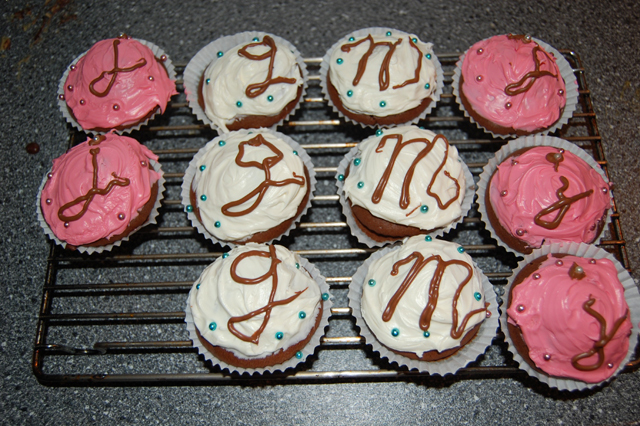 They didn’t take long, but I think I definitely need to improve my icing skills. Still for a first attempt I guess it wasn’t that bad. So I took em to the party and expected Jill to place them out for everyone to taste. But she got them locked away, and has probably forgotten to pick them up so they will be stale by now.